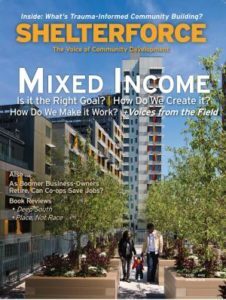 For decades now, “mixed-income” has been a watchword throughout the affordable housing and community development worlds. Compared to the worst examples of urban design that have physically isolated low-income families, mixed-income housing seems like an intuitively healthier, more equitable way to go about designing neighborhoods. Sharkey is talking about racial integration, but the question also holds true for economic integration: goals matter, and they have implications for implementation. For example, are we trying to improve the odds of those children who can get an affordable home as dramatically as possible, or are we trying to maximize the number of affordable homes we’re able to provide in neighborhoods with a certain baseline of amenities and opportunities? Do we believe the value in economic integration is primarily for low-income families, for all residents, or for the regions or municipalities whose neighborhoods are being integrated? Do we believe the benefit for low-income residents comes primarily from access to a better neighborhood (public safety, school quality, transit connectivity, access to jobs, green space, etc.) or from diversified social networks? Also, what are the down sides? Are we sacrificing the total volume of affordable units? Are we overlooking the value in the social networks present in poor communities and underestimating the harm of losing those networks? Will the dislocation of displacement for some outweigh the benefits to those who can stay? These conversations can get delicate. I regularly cringe as I hear patronizing commentary that assumes that low-income people will benefit from higher income “role models,” and even “different social norms,” as if there were something inherently virtuous about not being poor. Slipping into such formulations is shameful for equity advocates. On the other hand, I have also heard folks who grew up in low-income communities forcefully make the case that it is harder to imagine yourself in college, for example, or leadership positions without people around you who have gone down that route and know how it works. The difference there, while important, is also subtle. There are no universal answers to these questions, but how we approach them affects on-the-ground implementation. Reports from many mixed-income developments tell us that the reality is not yet living up to the ideals—stigma and social segregation are stubbornly hanging on. Many in low-income areas consider “mixed-income” as code for gentrification. In our “Voices from the Field” survey results you’ll see that most survey respondents saw multiple benefits to the idea of mixed-income housing, but many were also skeptical or cautious about implementation. In this issue, our authors tackle these questions from many sides. Rick Jacobus argues that the research shows benefits to integration at a neighborhood level—amenities and access to opportunity—and says that we can get the best benefit for the most people by focusing on neighborhood, but not building-level integration. HOPE SF is trying to learn from the mistakes of past HOPE VI projects—starting with a 100 percent right to return—and it isn’t easy. David Holtzman spoke to many developers who had worked on mixed-income projects to get their insights from everything from financing to governance, while trauma-informed community building,” an approach to working with residents who have experienced various sorts of trauma that often come with being poor, isolated, and oppressed. This approach recognizes the particular effects that trauma can have that can work against community building efforts, and addresses them in ways that don’t disempower the residents along the way. And finally—would you like to know how to stem one of the largest causes of job loss in the country? Shelterforce’s Keli Tianga explores how worker co-ops can step up as baby boomer business owners retire.